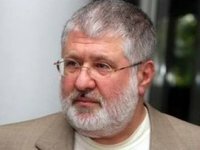 Ex-shareholder of PrivatBank Ihor Kolomoisky has stated the need to change the jurisdiction of the High Court of Justice in London due to a lawsuit filed to the Ukrainian court for libel on the part of former head of the financial institution Oleksandr Shlapak, according to the materials of the judicial proceedings available to Interfax-Ukraine. At the same time, Hogan Lovells law firm (Britain), representing the interests of PrivatBank in the High Court of London, drew attention to the unnaturalness of such a statement. "The claim [which Kolomoisky refers to] is based on one statement of the ex-head of PrivatBank [Shlapak] made at a press conference in July 2017, the truth of which is not even refuted," the lawyers of Hogan Lovells noted. Earlier, at the end of 2017, a person, named in the proceedings as Person 1, filed a suit to Kyiv's Pechersky District Court against PrivatBank. The plaintiff demanded that the following statement by Shlapak made at the press conference at Interfax-Ukraine in July 2017 be recognized as unreliable and degrading his honor, dignity and business reputation: "all 36 credits were signed by the former chairman of the board (at that time Oleksandr Dubilet) with excess of authority." The matter concerns loans to 36 companies for UAH 133 billion, which were issued in October-November 2016 and through which the loans of 193 other borrowers of PrivatBank were repaid, while more than half of them had a rate of 12-12.5% per annum and were linked to the U.S. dollar exchange rate and real collaterals. "The loans were granted without proper approval or due diligence processes, whilst the supply agreements were produced as a facade to enable $1.9 billion to be paid to six companies: Teamtrend Limited, Trade Point Agro Limited and Collyer Limited (all English companies), and Rossyn Investing Corp, Milbert Ventures Inc and ZAO Ukrtransitservice Ltd (all based in the British Virgin Isles). None of the companies had websites, offices, staff, warehouses, a workforce or any other public presence. The scheme was the brainchild of Kolomoisky and Boholiubov who at the time were the owners of more than 90% of the shares in the bank and sat on its supervisory board," the lawyers stated.